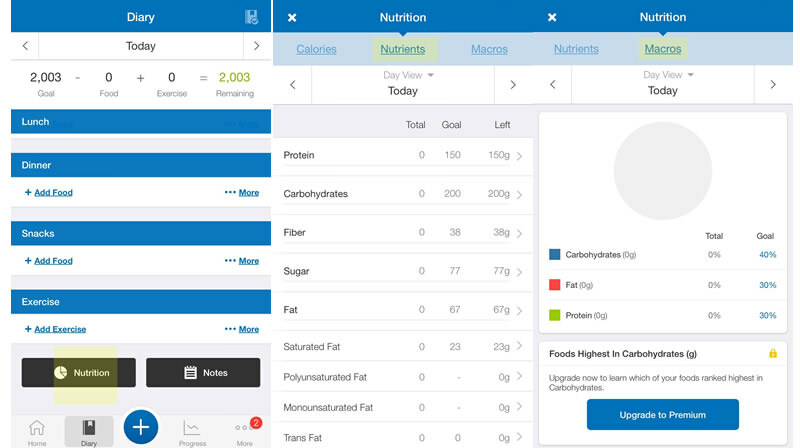 MyFitnessPal can be a great tool to use when you are counting macros or flexible dieting. (a.k.a. IIFYM (If It Fits Your Macros). However, it can be a bit tricky to set up, so we thought we could help by offering this tutorial guide that you can use to get everything set up, as well as some pointers to use along the way. NOTE: My Food Diary or Cronometer or MyMacros+ are great alternatives, that many find far easier to use. I’ve been using MyFitnessPal (iOS or Android) for a long time now and I can see first hand how powerful it is in helping you track your macros and keep track of your calorie burn. It takes some practice and a little patience but after a couple of weeks, tracking becomes routine and highly worth it. Once you know the flexible dieting/ counting macros basics, here’s how to get started. 2. Open the app and log in using your facebook or twitter account (easiest), or create an account using a valid email address. 3. 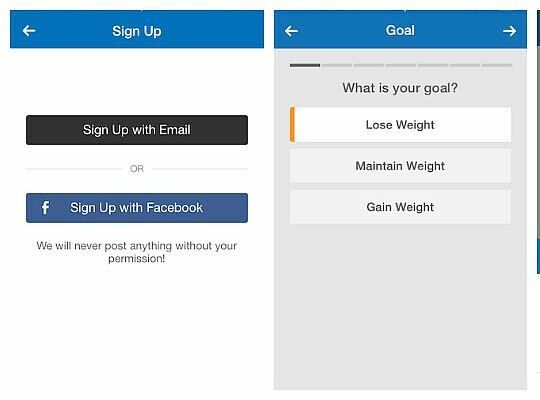 MyFitnessPal will then ask you to enter some information including your goals, fitness level, height, weight, age, gender, exercise level, and goals. Enter this information as directed. 4. The app will then construct a plan for you consisting of your TDEE (total daily energy expenditure) based on the information you provided, but the app doesn’t use a macros approach so you’ll have to manually enter your own TDEE and macro goals. Here’s how to manually adjust MFP to fit with IIFYM. First use our macro calculator to calculate your TDEE and Macro amounts. 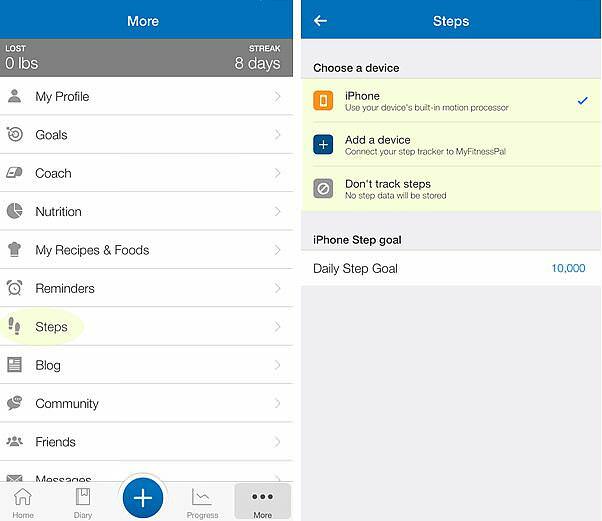 Before you enter anything into MyFitnessPal, you must decide whether you want the app or compatible device to track your daily exercise or not. By tracking your daily exercise, it can give you a much better idea of how many calories you’re burning each day. 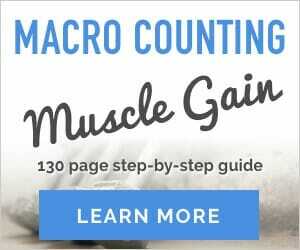 However, this makes tracking your macros more difficult because they are fluid, meaning the more exercise you do, the more carbs, protein, and fat you’ll have to eat to meet your daily goals. If you want MyFitnessPal to track your exercise, you must choose “SEDENTARY” on our calculator and then enter those numbers manually. A simpler method is to estimate your activity level using our calculator and then enter that data manually into MyFitnessPal and turn off exercise tracking. This way you will simply eat the same amount of each of your macros each day. 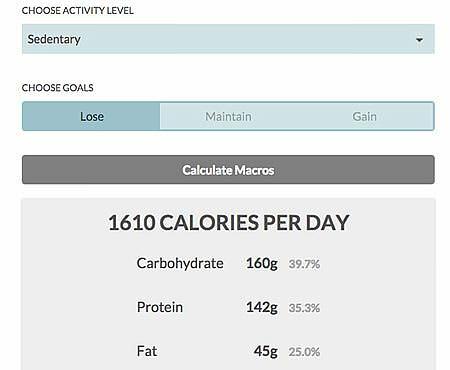 While this makes it easier to track your macros it doesn’t account for varying exercise levels throughout the week or on rest days. From the home screen, click on the “More” button at the bottom of the screen. Then click on the “Goals” heading. If you are tracking exercise adjust Activity Level to sedentary. Or, choose the appropriate level. 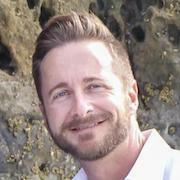 Under the heading Nutrition Goals click on “Calorie & Macronutrient Goals“. Now enter your calorie amount given by our calculator and adjust carbohydrates, protein, and fat to the percentages given by our calculator. Note: You’ll have to round to the nearest 5% increment unless you have the Premium Version of MFP. This allows you to adjust your macros at 1% increments or just enter the gram amount. Also do not pair any other fitness tracking apps or devices with MyFitnessPal nor add any exercises in your daily food diary. If you are tracking exercise then enter your Sedentary TDEE and macros as just described, allow MyFitnessPal to track your steps, and pair other apps like MapMyFitness and devices such as Fitbit. Note: I’ve consistently found that FitBit OVERestimates your daily calorie burn so be aware of this. Also, for any activity not tracked by these devices, you’ll have to manually enter it into your food diary each day. Does this by clicking the “+” and then selecting “Exercise“. 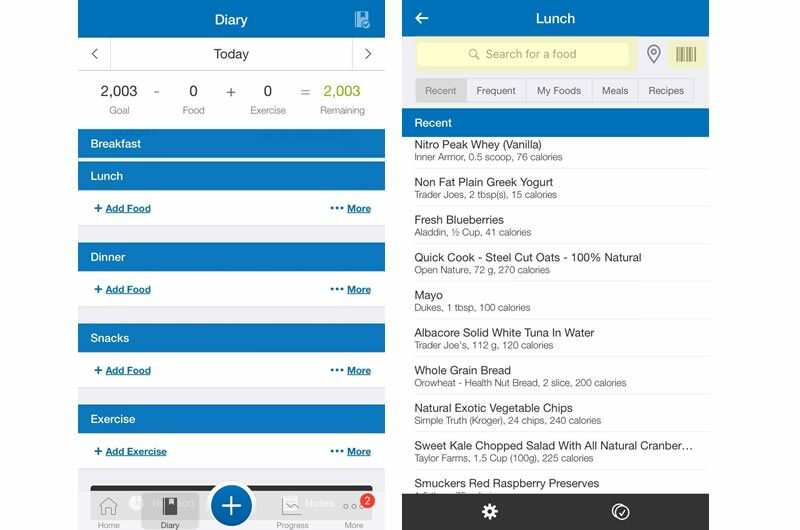 Tracking how much food you eat is pretty simple using MyFitnessPal. 1. To get started, click on the diary button at the bottom of the screen. 2. Then click the “add food” button below the appropriate meal. You then can search for a food, enter it manually, or scan the barcode of the food you are eating with your device’s camera. Adjust serving size as necessary and then click the check mark at the top of the screen. The more you do this, the easier it gets as MyFitnessPal remembers your prior foods and suggest things you normally eat. It also may be useful to purchase a digital food scale to more accurately weigh your food and establish more accurate macro amounts. 3. Keep track of your macros as you eat. Scroll to the bottom of the diary screen and click the nutrition button. It will then allow you to use the tabs at the top to see how your macros and calories are tracking for the day in question. “Macros” shows you a pie chart and percentages while “Nutrients” shows you the gram breakdown. Now you can see your progress for the day so far and how many grams short or over you are in meeting your daily macro goals. Note: Once again, if you are tracking exercise, your macros will be constantly changing based on the amount of exercise you do that day, which can make meeting your goals more challenging and harder to plan for. 4. At the end of each day click “Complete Entry”. MyFitnessPal is designed to track your progress, so every 2 or 3 days you should weigh yourself using a digital scale and enter your weight by clicking the + button and then the purple weight button at the bottom of your screen. For every 10 pounds of weight lost or gained you’ll need to return to our calculator and recalculate your macros based on your new weight. Then enter this updated info into MyFitnessPal as instructed above. The more you use MyFitnessPal, the more you’ll discover! 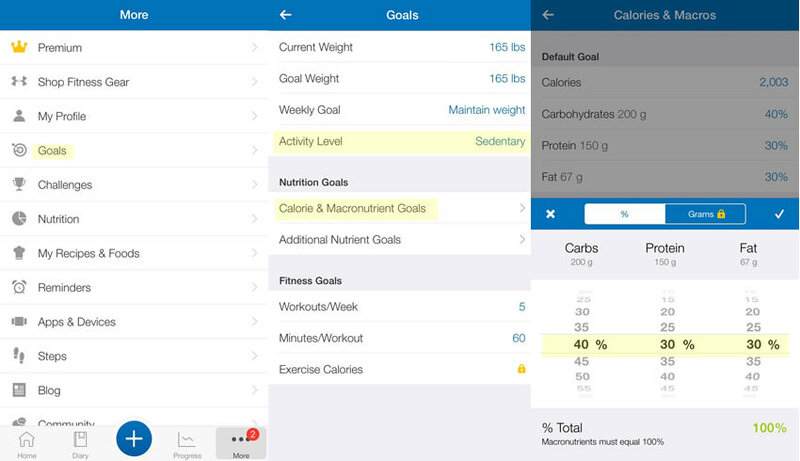 There are a few limitations with using MyFitnessPal to track your macros as part of the flexible diet. First, the app doesn’t allow you to enter macro amounts, but only percentages. Secondly, these percentages are in 5% increments when our calculator at times could give you 1% increments. Only the Premium Version will unlock the ability to do this. This runs $10 a month or $50 a year paid up front. Thirdly, I’ve noticed when you are tracking your exercise, sometimes things are recorded twice so pay attention to this if you have picked this option and delete the duplicate by touching “edit” at the top of the diary. If you are tracking your exercise, MFP will keep adjusting protein until you are eating crazy amounts if you have a big exercise day. Find your max daily protein amount using our calculator (including exercise level) and then stop when you get to that amount. Consume the rest of your calories at your percentage of fats and of carbs on big exercise days. We want to reiterate the importance of inputting your SEDENTARY calories if you want MFP to track your calories burned through exercise. If you don’t do this you’ll be eating too much since MFP adds exercise calories and macros back into your daily totals. 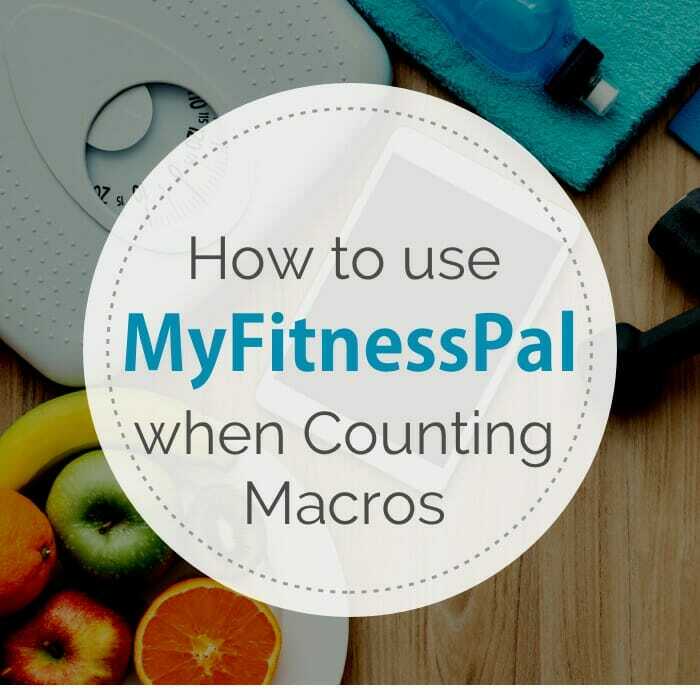 Do you have any tips or pointers for others who want to use MyFitnessPal to keep track of their macros? Litman, L., Rosen, Z., Spierer, D., Weinberger-Litman, S., Goldschein, A., & Robinson, J. (2015). Mobile Exercise Apps and Increased Leisure Time Exercise Activity: A Moderated Mediation Analysis of the Role of Self-Efficacy and Barriers. Journal of medical Internet research, 17(8), e195. Study link. Hello Ted, I’m not really sure what activity level to choose. I do weight training 4 days a week. I usually don’t do a lot of cardio except my 5-10 mins on the treadmill for my warm up before my weight training workouts. Somedays I will do yoga and light walks with my dog. I also have dance classes 2-3 day a weeks. Usually about 2 hours light dancing and about 30-45mins of moderate dancing hours in total a week. Should I put “moderately active” in the IIFYM calculator or “light activity”? Hi Mara, You can get a better sense of your daily calorie burn by using our activity calculator here. It should help you determine which to choose. I can’t really tell because I would need a bit more information. I use to be able to see my macros for each item I ate that day & there was a banner after the last meal/snack that said “goal” which helped me to know how close I was to reaching that particular macro, but now it’s gone. All I see now are the macros for the total meal and no “Goal” at the bottom. Does anyone know how I can get that display back showing macros for each item and a running total on the food diary page? If you click on the food item, it shows you the macros for that particular food. To see your running totals for the day, click on “nutrition” at the bottom. Does each meal need to be in close to desired percentage in Macros, or does the end of the day just as desirable? If you come out at the end of the day with the right percentage, you’re doing well! Breaking down into meals can help you learn the appropriate macro amounts at each meal time. But focus on the overall daily total. Hi Ted, I was wondering if you could help me with something. I’m a 23yo female, I weight 77kg and my height is 161cm. I started using MyFitnessPal a couple weeks ago to track my eating, but I was just trying to stay within the calories that the app calculated for me, which was 1350 calories. After 2 weeks of following it (although last weekend I exceeded my calories a little and brought my weekly average to 1415 calories, I ended up losing 2kg. The situation is, anytime I calculate my TDEE with your calculator, it gives me a higher calorie amount! But since I lost a good amount of weight with the app amount, I don’t know what I should do. Is it because I’m obese and I have to calculate with lean mass? I aim to lose 41pounds approximately. I hope you can help me!! Thank you very much! Hi Lara, It looks like MFP has you at your REE (resting energy expenditure) while our calculator is adding a sedentary factor. Since you aren’t laying in bed all day but up living your life etc., you should be accounting for that movement. Otherwise, you risk plateauing if you are in too much of a deficit. Besides, your weekly average was almost what our calculator recommends for you and you lost at a good rate. Do you do additional exercise? You should be accounting for that as well if you want to keep your metabolism healthy. How you track ALCOHOL into MFP?? I was told to log as either fat (dividing calories by 9) or carbs (divide by 4). Bit I can’t figure out how to log it into the system. MFP adds alcohol to your Calorie totals but not your macros because it is its own macro. One days you drink, hit your protein target but let the alcohol calories count toward your fat and carbs so stop tracking when you hit your calorie total for the day. The remainder of your carbs and fat will be used up by the alcohol. Hi Ted. This is a very informative site. It’s helped my wife and I both to not only invest in the premium version but to set it up properly. Thank you. My question is… We have everything set up and used your calculator to input our macros goals. We are using flexible dieting. I understand that you have to keep an eye on protien as the app will increase that as you excersize. When I go to MENU – GOALS – EXCERSIZE CALORIES (ON) it gives the option at the bottom for “assign excersize calories to macros by:” then gives the option for current daily percentage or custom percentage. Can I set that custom percentage to where it won’t increase my protien but allow carbs and fat to increase as I excersize? Great to hear that our site has been helping you. I don’t believe you can lock the daily goals to combine both grams as well as percentages. So for big exercise days, as the article suggests, stop eating the protein, but fill out the rest of your calories with carb/fat. It means your calories should still come in okay for that day, but your macros won’t quite match what My Fitness Pal suggested. Hope that makes sense?! it’s a bit confusing. Thank you for your help James. I found a way to do it in MFP. You have to be a premium member I believe. If you go to your goals you can set up how it sounds your excersize calories. Set the protien to 0% and it will only increase you’re carbs and fat as you excersize but leaves your protein where you set it avoiding to the calculator. Making it much easier for flexible dieting. Right. That’s a good tip. Good luck! **”adds” your excersize calories, not “sounds”. so which one should you following the nutrients tab or the macros tab. The nutrients tab actually is the one that shows you the running totals of your macros in grams. This is the one you want. Hey there! I am confused and looking for some advice. I am a 36 year old female at 5′ 8″ and about 115lbs, looking to put on a little weight since this is under weight for my frame. I am a runner, running average 5 days a week at an average of 4-5 miles a day. And I am also currently trying to add 2-3 days of cross/strength training. I have calculated my macros at lightly active. Currently I am going off of my calculated macros, am I to input that into MyFitnessPal for tracking purposes? If my Garmin is linked to MyFitnessPal and I “earn” macros/calories from my activity, am I to include those macros/calories in my daily goal or keep it at what was calculated via your calculator? Currently set at 2000 cal. Any advice you can give would be greatly appreciated! Hi Lauren, Sure, happy to help. Running 4-5 miles wouldn’t be considered lightly active it would be moderate at least. If you are tracking your exercise via Garmin then you should set our calculator to sedentary, enter those numbers into MFP and then allow MFP to adjust your macros at the percentages set based on what your wearable tells it. This way you are eating according to exactly what your body needs on that particular day. Make sense? Thank you SO much for your quick response! 🙂 I had definitely considered it to be moderate, but was playing it “safe” I suppose by calculating with lightly active. I appreciate your clearing my perception about that! My only concern with going off of what my wearable calculates as calories burned is that so many of them have been accused of over estimating calories burned. I had previously had it set this way though and just recently changed it based on different things I’ve been reading. You are correct about the devices over-estimating. I think this is more so with general movement (casual steps) than purposeful exercise. You could only use it during your runs and compare its results with the results of established exercise databases for someone of your stats doing a 4-5 mile run. Here’s a good source to use: https://www.freedieting.com/tools/calories_burned.htm. I’d be interested to know how it compares, if you don’t mind? Also, on MFP they have a setting for activity level… How do I set theirs? If I change it, it adjusts the macros c/f/p to different amounts for each setting. Set their’s to sedentary and then manually set your macros with what you calculated. Yes, that was correct. I have a question about cycling the diet. I want to take in a higher level of macros on the days I am working out and less on the days I am resting. Can I set up MFP for that, or will I just have to keep track? Will it work if I track exercise? I’ve read through the comments hoping I wouldn’t have to ask the same kind of question, but here I am! So, I’ve been using MFP for a while now, set on lightly active, tracking my exercise manually and my steps. But now that I’ve discovered IIFYM, I’d like to try and manually adjust my macros, while still track my exercise manually (which is much more adequate for me). I’ve just used your calculator, setting it at sedentary as instructed. Now two questions, just to be absolutely clear: First, the result I get does already factor the -20% in it, doesn’t it? I just want to make sure this is my actual calorie/macro goal and I do not have to stay under it by the end of the day. And second, I have set your calculator to sedentary, but do I leave my MFP profile to lightly active or do I set it to sedentary too before entering my macro/calories goals manually? Hi Ash, If you selected “lose” on our calculator then the 20% has already been deducted. 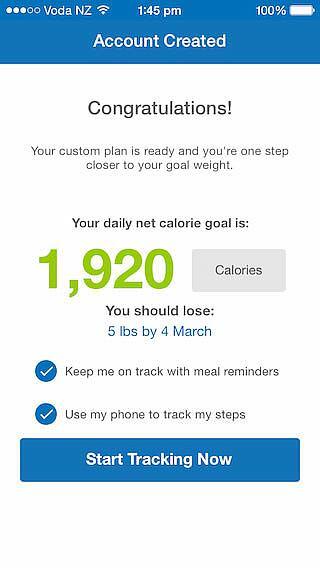 I think if you manually adjust your goals it overrides MFP so I don’t think changing from lightly active matters. But to be safe, change MFP to sedentary as well but do this before you manually adjust your calories and macros. All the best! Hi Kerrie, If you used our calculator to factor your TDEE and selected “lose”, 20% has already been deducted. Ted, I’m really confused now… I just bought the EBook – I need to lose, but am I plugging my TDEE(2115) into MFP and figuring the percentages, or the number from the calculator here (1670) and THEN breaking down the percentages? I think the online example of 3250 calories just confused me too much! I normally do 4 days per week of cardio two of which include some sort of weight training. I have a Fitbit attached to MFP unless you think I should disconnect that? Hi Sharon, Thanks for your purchase. You should use our calculator and then manually adjust MFP to reflect the TDEE and macro percentages given. You’ll have to round to the nearest 5% if you don’t have the premium version. You can either enter your exercise level in our calculator and then turn off exercise tracking in MFP or you can select sedentary on our calculator and then allow MFP to adjust your TDEE and Macros based on the data your activity tracker sends. This may be the best option since you have varied exercise two of your four days and also you should use your sedentary macros on rest days.